NASCAR's Daniel Suarez isn't the status quo, he's the disruptor. The 2016 NASCAR Xfinity Series champion is a skilled racer, a smart man, and the living definition of diversity. Far from being a chimera, Suarez is a reality—and one that will be talked about for decades to come. It's easy to get caught up on Suarez's nationality. Yes, he's the only Mexican in a sport that's predominantly for white Americans. In fact, he isn't just the only Mexican, he's the only foreign full-time driver in all of NASCAR. The media has squeezed every drop of salsa out of that narrative: "Mexican National Wins in NASCAR." And for good reason, it is a big deal after all. That being said, to focus on Suarez's nationality and his involvement with America's premier stock car racing series is to do the face behind the helmet a disservice. Suarez, just like all three dozen or so drivers currently competing in the 2018 Monster Energy NASCAR Cup Series, is nothing but a human being who followed his ambitions, exploited his talents, and like Suarez himself said, "got a little lucky with his timing of things." I recently had the opportunity to talk to the 26-year-old racing driver for Joe Gibbs Racing while at Richmond Raceway in Richmond, Virginia. Despite having been diagnosed with a fractured thumb at the O’Reilly Auto Parts 500 at Texas Motor Speedway just a few days ago, Suarez was already hard at work ahead of his next race. After a brief introduction, and despite his mastering of the English language, I asked Suarez if he was okay with performing the interview in his native tongue. After all, Spanish as a first language is one thing we both have in common. He quickly readjusted his mindset from one idiom to another and said: "We can do it in French if you want, let's go!" Daniel Suarez at the wheel of the #19 STANLEY Racing for a Miracle Toyota for Joe Gibbs Racing. The Drive: Daniel, before we dive into more personal matters, tell me, how’s the 2018 season treating you? Daniel Suarez: It’s been difficult, it hasn’t all been good, but within all the negativity there is something positive. We’ve had some problems but we have good speed. In reality, we just need a little bit of luck. What’s the key ingredient that's missing? Consistency. We need to carry our performance from practice day into race day. Sometimes the car is really good during practice, but things change once it's time to go racing. We have to work on being consistent in several areas. Let’s do a 180-degree spin away from the circuit and into your personal life. What’s Daniel like at the track and away from the track, what are the similarities and the differences? I believe that when I’m at the track I’m definitely someone who’s more aggressive, more focused, more on edge. I have to be. Outside of the track I’m much calmer and definitely a lot more fun when I’m with the family or just relaxing. In the end, I know that I have to play two very different roles in order to perform the best I can in each aspect of my life—at the track and away from the track. You mentioned relaxing and having fun away from the track, what exactly do you like to do in between races or during the off-season? Of course, considering you’re not having to deal with sponsor commitments. One of the activities that are most meaningful to me is working on my classic cars. It helps me relax. Spending time with my family, of course. I try to do this as often as I can, but the NASCAR schedule, as you know, is quite demanding. I really try to disconnect every opportunity that I get. Your dad’s car restoration shop in Monterrey, Mexico is well-known for its beautiful creations, specifically when it comes to vintage Volkswagen cars. 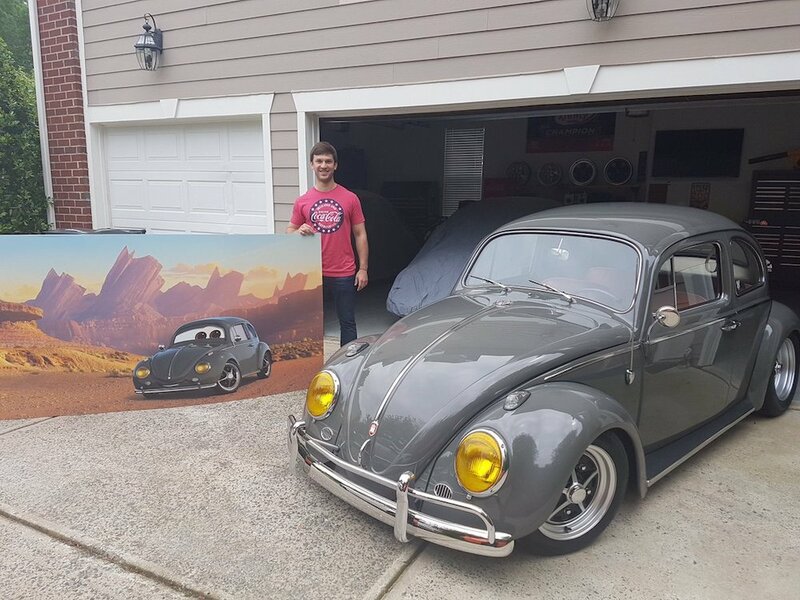 Is this where your passion for classic cars comes from and is it only for Volkswagens? I really like all kinds of classic cars, but there’s a special place in my heart for old-school Volkswagens, whether they be “Combis” or “Vochos” (Latin American slang for VW “Buses” and “Beetles”). I grew up around them and that’s why I gravitate towards them so much. Even your fans have been captivated by your passion for vintage V-Dubs, is this correct? Yes, it’s been a lot of fun. My own fans and NASCAR fans, in general, have taken an interest in my classic cars. I love working on them myself—it’s my therapy. 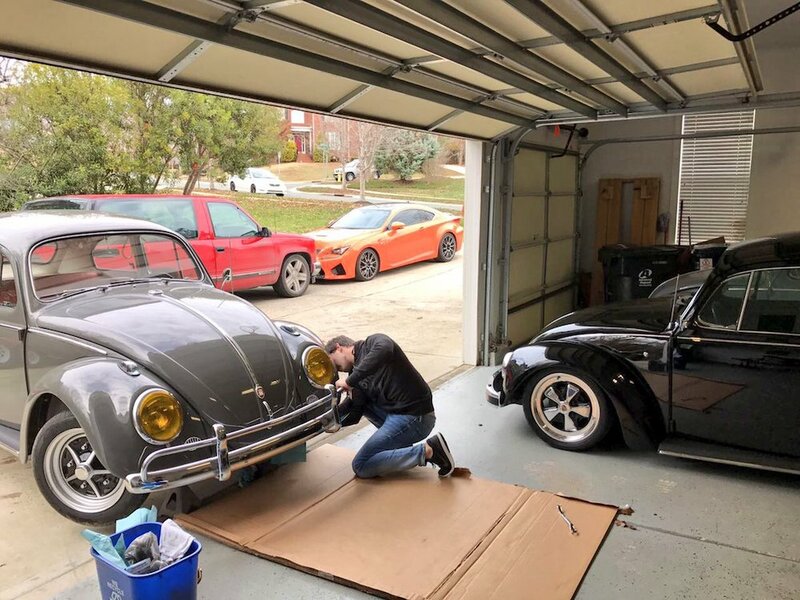 It’s also really cool for the fans to see what I like to do when I’m not at the track, when it’s just me in my garage with my old cars. Racing drivers, whether NASCAR or IndyCar are known for sometimes bringing their personal flashy cars to the paddock. Have you ever taken one of your vintage Volkswagens to the track, one of your Vochos? Of course, many times! People love them. In fact, folks already know that if they spot a classic car or a vintage Volkswagen, chances are that it’s mine! Your dad obviously played a big role in your childhood, that’s why you love classic cars so much and that’s one of the reasons why you’re in NASCAR today. But what role does your dad play now that his son has made it to the big leagues? Both, my mom and my dad, played the most important role of being, you know, my mom and dad. Obviously, that’s never changed whether I’m in karts or NASCAR. They’ve never treated me differently based on whether I’m doing things right or wrong on the track. They are always there and they sacrificed a lot so I could continue my racing career. I’m a parent, and I know that parents usually tend to steer their children—whether six years old or 30—towards what they think is best. Is this the case? Are they still a factor in the big decisions you have to make in your career? No, they’re not so involved anymore in the decisions I have to make nowadays. Of course, they always know what’s going on—they’re always informed. This is only because what’s going on today is beyond their level of experience. Teams, sponsors, contracts, etc., they get to comment and have their opinion, but they're no longer involved in the decision-making process. Speaking of teams, sponsors, contracts and so forth, let’s talk about a few of your countrymen who have come before you, and a few who have catapulted Mexico back into the spotlight in recent times. Legends like Adrian Fernandez, Michel Jourdain Senior and Junior, Mario Dominguez, Luis Diaz, Memo Rojas Senior and Junior, and more recently Sergio Perez and Esteban Gutierrez. Their careers all have two things in common: Europe and open-wheel racing. Why not Daniel Suarez? The main reason I chose NASCAR was that I wanted to be the first one to do it. But first of all, all the people you just mentioned are my friends, and I know them very well and have the utmost respect for them. Especially Adrian (Fernandez), I grew up admiring him and watching him race at the ChampCar race in Monterrey (Mexico) back in the day. With that being said, I wanted to be the one who laid down a path for future young drivers who desired to make the jump to stock car racing at its highest level. Do you believe that you can actually influence the upcoming generation of young racers interested in NASCAR, whether they come from Mexico, South America, or even the United States? Yes, I am sure. I don’t have a doubt about that. Before me, there wasn’t a direct path to NASCAR if you came from Mexico. There were a few who came over to the States for a race or two, or maybe a season here and there, but no one did it full time or “fuerte” (in a strong manner). Again, there wasn’t a trajectory for anyone to follow, and when there isn’t a trajectory, young drivers become doubtful or worried that no one’s interested or willing to support them. Now that my career is no longer a future project but a reality, I truly believe that there’s a trail that others can follow if they want to pursue their ambitions all the way to NASCAR. You mentioned that before you, there were a few other racers who came over to the States and did brief stints in stock cars, but ultimately nothing ever happened. What did Daniel Suarez do that the others didn’t? You know, that’s a really good question. It was a combination of things. One of the things I had going on for me was my age. Also, the timing was right. There were good things happening in the world of stock-car racing, there were good things happening with sponsors, and all of that opened a few doors that ultimately made things happen for me. Oh, and I also got lucky. There’s always a bit of luck involved. Last question for you, Daniel. I tried my best to phrase this in a way that it doesn’t insinuate that you might regret not following your initial desire of going to Europe and chasing the Formula 1 dream, because I truly believe you don’t. But, do you ever look back and think “What if?" I do. I think it would’ve been cool, but I don’t think I’d enjoy it more than what I do now. Plus, the way things are in Europe, and I don’t think that I could love racing as much as I currently do in NASCAR. I take care of myself physically and mentally, and I expect to have a very long career in motor racing. I still race karts for fun, and in due time, endurance races in prototype-style cars. But when I do, It’ll be because I love racing and not because I’m desperately chasing a career or a buck. NASCAR has all the right qualities to be my lifelong career—everything else I do will simply be an extra. I know I said it was the last question, but did you just tell me that you’ll be endurance racing at the wheel of a Le-Mans style prototype? Eh, I’ve always been interested in endurance racing, and the opportunity to do so has come up before. For one reason or another, whether due to physical preparation or scheduling conflicts, I’ve never been able to make it happen. But I really like that style of racing, and I will do it someday. There’s Juan Pablo Montoya for example, with NASCAR, Formula 1, and IndyCar experience, he’s now headed to Le Mans later this year. Yeah, maybe I’ll do something like that someday. It’s not easy with the NASCAR calendar, which I truly believe is the busiest racing series in the world. We’ll see, one day.